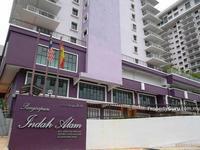 - V-Residensi 2, Seksyen 22, Shah Alam. V-Residensi 2 is a brand new condo (just collected keys). It is a freehold mixed development located in Section 22, Shah Alam. It has low density with only 2 blocks comprised of a total of 616 units. The layouts are suitable for a medium-sized family. Kitchen cabinets with hob & hood, and air-conditioning for all the bedrooms and the living room. Balcony and washing area. Many amenities for shopping and school. Excellent accessibility via Elite, NKVE & Federal Highway & Batu Tiga KTM station. Shopping complexes within comfortable driving distance is the AEON & Tesco Shah Alam, Empire Shopping Gallery, Subang Parade and Carrefour Subang.